If you’re able to make a project look this good it shouldn’t be hard to convince that significant other to let you install it in a prominent place in the house. 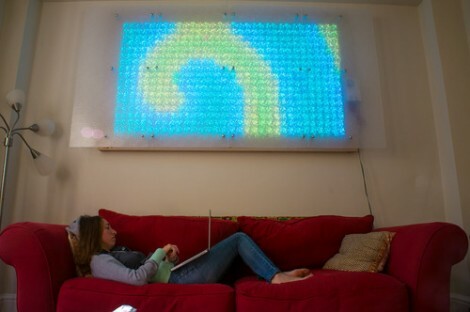 We think [Greg Friedland] pulled this off perfectly by building a 4’x8′ tablet controlled LED matrix. First of all, everything looks better in a shiny case. It shouldn’t come as a surprise that this looks nice, thanks to the face plates which are mounted in a way that gives them a modern style (we’d expect to see this hanging in Ikea). They’re acrylic diffuser panels meant for used with lighting in a suspended ceiling. They do a nice job of scattering the light put off by the 544 LED modules that make up the display. The wiring was made easy by using LED strands where each pixel has its own control chip (WS2801). It sounds like the display will peak at around 160 Watts, which isn’t really that much considering the area. One nice touch that’s shown off in the video after the break is a full-feature iPad interface that even allows you to paint in light using your finger. But we’re also satisfied that [Greg] posted about the physical build too.